It is hard to believe, but Dr. Richard Lin finally retired from Chinese Christian Church Music Institute for Worship (CCCMIW) on Saturday, November 30th. 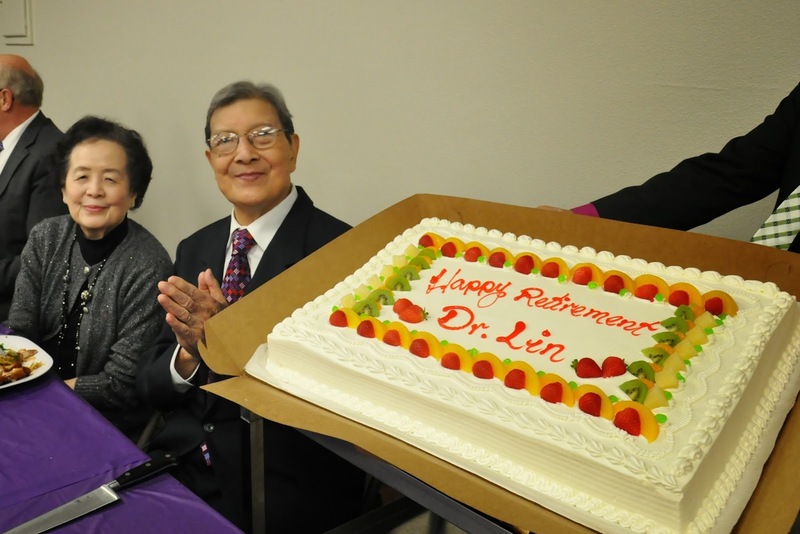 Dr. Lin devoted his whole life to worship and teaching others to do so. In 2003, five weeks after I had a major surgery, my then college-age son and I joined more than one hundred people to practice singing Handel's Messiah in the CCCMIW choir conducted by Dr. Lin. For one week, we practiced from early morning to evening. My son had no problem reading music. But as one of only two or three ABCs (American-born Chinese) in the choir, he found the Chinese text very difficult. He wanted to give up several times. We prayed to God about his decision as a family. Finally, my husband James read the Chinese characters one by one and let our son write down the phonetic symbols. This way, he could still practice his Mandarin during lunch breaks, learning from his Cantonese speaking mother. Thank God that after a week of practice, his Mandarin and my health both improved greatly. Finally we sang with the choir in St. Mary's Cathedral, San Francisco. Hallelujah. Praise the Lord! I have always liked to sing, but after being criticized a few times, I was afraid to sing in front of people. After the Lord found me in 1989, not only could I freely sing among our congregation and small groups, a year later I joined our church's choir. By the grace of God, someone told me that everyone was welcome to sing the Hellelujah chorus in our Christmas service. I was reassured that "the only qualification is a willing heart to learn." I went from participating in one event to singing week after week in the choir for a few years with great joy and satisfaction. Later, only due to schedule conflict, I left the adult choir ministry when I started teaching children's Sunday School. Unexpectedly, I had the opportunity to join the Thursday practice of CCCMIW choir in September 2001 with brothers and sisters from all over the San Francisco Bay Area. Dr. Richard Lin is a servant of the Lord by example and exhortation. "We are offering worship, not performance. Song leading is not preaching. And our purpose of praise and worship is to lead people to the throne of God." In the next few years, I also participated in his summer camps to improve my singing and learn how to lead singspiration and to select hymns and praise songs that match the sermons. With Dr. Lin's teaching, I always remember worship as a heart issue, even when we are singing and moving with children. Worship is to magnify the Lord. The hearts of song leaders need to be moved first before they can bring others to receive, enjoy, and feel the presence of our Lord. Dr. Lin, thank you for teaching and mentoring us. We love you! If you love church music but don't know who Dr. Lin is, you could check out his organization here.